Do you find yourself yelling at your dog to try to get him to do something, or stop doing something? While there is a chance that your dog will stop and pay attention to you for a bit, he will most likely repeat the behavior sooner or later. This is because he has not learned the lesson. Yelling at your dog might seem like it is working in the moment, but it really has no positive effect on your dog’s behavior. In fact, it can actually make your job more difficult. Let’s take a look at some reasons why you shouldn’t yell at your dog, and then we will give you some suggestions on what you can do instead. Your dog won’t learn from it. He doesn’t understand what you are yelling. He can sense your anger but can’t understand what you are yelling or why you are angry. Particularly if you are yelling over something you have just found, but that your dog did hours ago. Even if you are shouting about something that your dog just did, the yelling is not addressing the problem behavior. Your dog may become fearful of you. Just like with us, your dog can sense negativity when someone is yelling at them. If your dog senses anger in you, he may become scared of you. This will weaken any bond you have formed already with your dog and make it more difficult to get them to obey you in the future. If your dog is afraid of you, he will have trouble focusing when you are trying to train him. Dog’s respond differently to angry people. This study by Flom indicates that dogs can not only tell when people are angry, they also respond more slowly than they do when someone is being positive. It makes them more hesitant to do what is being asked of them. You may encourage and excite your dog. If your dog is barking and you start yelling at him your dog will think you are barking just like him. That will make him excited and bark even more. If your dog is chasing something and you start yelling, he thinks you are encouraging him or joining him in the chase. Just like another pack member might do. Making a lot of noise will often excite and encourage your dog when in fact you want to do the opposite. It may make your dog sneaky. If you yell at or scold your dog for doing something wrong, like peeing in the wrong spot, it may make him fearful of doing it in front of you. This will only ensure that next time he may do it when you are not around instead. You will end up finding his surprises in unexpected places. It is not good for your dog’s health. Yelling and shouting at your dog can put him under stress which is bad for his health. Stress can manifest in dogs in a number of ways, from loss of appetite and changes in bowel movements to isolation or aggression. It can lead to anxiety issues and can affect your dog’s physical well being. There are several approaches you can take to correct your dog’s bad behavior that don’t involve any yelling or raising your voice. Depending on the situation, try one of these tips and see how your dog responds. Ignore your dog. I know this sounds counterintuitive but punishing your dog when he does something wrong is a less effective way to change his behavior than rewarding him when he does something right. For example, when your dog is barking you should ignore him. But when he is quiet you should praise and reward him for being quiet. The quicker you reward your dog, the quicker he will learn the lesson. Continue to do this and over time he will eventually get it that he will receive no attention for barking. You should also find out the reason your dog is barking and fix it. Speak to your dog calmly and positively. Dogs respond more quickly when they sense that you are happy. Any kind of training or behavior correcting for your dog will be more successful when you are in a good mood. Learn some positive dog training techniques. Positive training techniques, like using praise and rewards, clickers, games, and toys, are an effective way to train your dog and correct bad behavior. Remain calm. You are most likely yelling at your dog because you are feeling irritated, frustrated, or angry. This is your problem, not your dog’s. Take a minute and calm down. You can still use an authoritative tone if you feel it is necessary, but do it in a composed manner to get your point across. Be consistent with your reprimands. A firm strong “No” can be used to let your dog know he is doing something wrong, but make sure you use the same command every time or your dog will get confused. Don’t worry too much. Whatever your dog did can be fixed with training, love, and time. And some patience on your part. 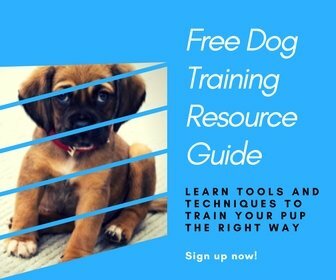 If you have the opportunity, you can put in the time and train your puppy from a young age and you will never have to yell at your dog for misbehaving. P.S. Help a friend with this advice on how not to yell at their dog by pinning this!